Kevin Crossley-Holland, master storyteller and winner of the Carnegie Medal, brings the gods of the Vikings to life as never before in these extraordinary new retellings, lavishly illustrated by Jeffrey Alan Love. Meet Thor with his hammer, Odin with his one eye and Loki the trickster. From the creation of the nine worlds to the final battle of Ragnarok, this stunning collection brings you one of the greatest and most culturally significant stories in the world. Whether you’re a fan of Norse mythology or new to this world of ancient magic, gods and giants, this is an unforgettable collection retold and imagined by one of the literary greats of our time. What are the Norse myths exactly? Clock’s ticking. Phew, lucky that Kevin Crossley-Holland, the Carnegie medal-winning author and poet, presumes ignorance from the start in this magnificent anthology. In the foreword of his book – a perfect Christmas present for little warriors everywhere – we learn that the Vikings believed that humans inhabited Midgard (Middle Earth) and shared it with dwarfs and giants. Above Midgard lived the gods in the realm of Asgard, and below Midgard was the third level, the world of the dead, ruled over by a woman whose body was half alive and half a corpse. The axis of these three levels? A colossal ash tree, which everything alive depended on: the Tree of Life. A man in Iceland called Snorri Sturluson (expect guffaws) eventually wrote down these myths, which Crossley-Holland read as a child and became entranced enough to write his own versions in adulthood. It’s impossible not to be captivated by these extraordinary characters, aided by Jeffrey Alan Love’s tremendous pictures of gods and goddesses, dwarfs and giants. Crossley-Holland, who has translated Beowulf and is an expert in Norse mythology, is a natural storyteller who wears his learning lightly. He writes beautifully, dramatically and accessibly, whether he’s telling the story of one-eyed Odin, Thor’s mighty hammer or tricky Loki with the flaming hair. There is a helpful glossary at the back that allows you to tell your Aegir (the god of the ocean) from your Ymir (the first giant, made of fire of ice). In Britain, Roger Lancelyn Green’s Myths of the Norsemen (1960), and in America Ingri and Edgar Parin d’Aulaire’s versions of the same (1967), revealed a mythology that stimulated a generation, among them authors such as A.S. Byatt and Michael Chabon. From Tolkien to Rick Riordan, from Catherine Fisher to Cressida Cowell, its subversive tropes have permeated popular culture. Most recently, Francesca Simon’s The Monstrous Child used the myth of Hel, goddess of the Norse Underworld, to riff on disability; George R.R. Martin’s A Song of Ice and Fire (dramatized as A Game of Thrones) relies on Ragnarok. Thanks to Marvel the Norse gods are even familiar superheroes. 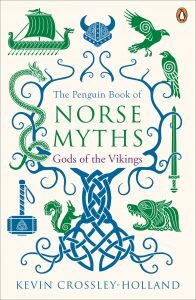 An acclaimed author, poet and translator, Kevin Crossley-Holland has previously written The Penguin Book of Norse Myths, but this new volume is for younger children of eight and over. A master storyteller, Crossley-Holland switches his prose without apparent effort from the formal and poetic to the informal and conversational, adding dynamism and detail. There are jokes, arguments, boasts and unforgettable images generated by Crossley-Holland such as a hall in the kingdom of the dead where there are “plates and knives and spoons on the black tabletops, all made of glistening jet”. Beautiful Balder is murdered by a tender sprig of mistletoe, sharpened by Loki and flung by Balder’s blind brother. Each story is short enough to read before bedtime but long enough to contain drama, wonders and yet another triumph for the gods. It is the humour, moral ambiguity and inescapable impetus towards tragedy that makes Norse myth so unusual. As we destroy our own planet, it is no wonder these themes resonate. To this, Jeffrey Alan Love’s pictures add a monumental grandeur. Love’s craggy black silhouettes stamp a graphic power, mystery and dynamism on every page. Crossley-Holland’s inspired text is straightforward and largely unadorned in a way that makes it timeless. Meanwhile, Love’s eye-popping expressionist illustrations, rendered in acrylics and ink, decorate almost every page, beautifully creating an often sinister atmosphere that expands the tone of the text. Together words and pictures work to memorable effect, doubtlessly inspiring their young readers to yell and cry. The myths have seldom been better served. Twenty tales of gods, giants, and dwarfs, of mighty feats and epic trickery…the tales are…powerful in emotional resonance–not to mention chock-full of bold deeds, glittering treasures, and scary monsters. Lavishly illustrated and strongly atmospheric–as well suited for reading aloud as alone. Kevin Crossley-Holland is a master storyteller who over the years has been the definitive re-interpreter of myth from many lands – making the stories live for children and adults alike. This isn’t the first time he’s explored the Viking heritage and I’ve personally always thought that the Norse myths are the most thrilling and most immediate. Crossley-Holland tells them here with an economy of style, using straightforward narrative and eschewing complexity in favour of the simple recounting of stories. It all looks so easy but writing like this takes years to master and you know you’re in very safe hands when you don’t even have to think about the act of reading and you can just let the tales sweep you along. The author has also been kind to us – he doesn’t assume we know anything about the Norse gods and their, inevitably, complex set of inter-relationships. To help us along he gives us a really useful who’s who and a cunning guide to the universe of this particular mythology and I found the graphic that shows us Yggdrasill (the tree of life) and the three layers of existence, along with the inhabitants of those lands, incredibly valuable in terms of understanding who relates to who. All mythologies and creation stories share common features and I suspect that like me you’ll find yourself spotting these but this is most certainly not an academic treatise about Norse mythology; it’s a collection of fabulous and exciting – sometimes brutal and sometimes bloody – stories that you’ll want to read either because you kind of half know them or because they’re completely new to you and thrilling because of that. Here Crossley-Holland doing what he always does so well – finding the universal truth in the myth. No-one can deny Fate. Her gifts are unearned and her punishments undeserved. The cast of characters is also irresistible and each one of them has a personality you’ll recognise – they may be gods but they’re also all of us too. We probably know many of them – the steadfast and dependable Thor; the cunning trickster, Loki; gentle and caring Balder, Odin the Allfather and Frigg his wife. But there are plenty we don’t know and should – Idun, keeper of the golden apples of youth; Sif, Thor’s wife; or, the dwarfs Fjalar and Galar who brew the mead of poetry. Fabulous stuff in the very literal meaning of those words. But that’s not all. This book also gives us the stunning illustrative work of Jeffrey Alan Love. Working on the big scale he uses what looks like a block or lino printing technique to create dark and menacing images. His use of the occasional slash of red colour or the tingeing of green gives the drawings a startling added dimension. There’s something about the vast wilderness of Scandinavia, and the ancient mythology it produced, that captures the imagination of people across the world. We see elements of it all over modern pop culture. On TV we have the hugely successful Vikings series, not to mention Norse elements of cult favourite Game of Thrones; on our cinema screens we have the Thor films of the Marvel juggernaut, and the continued success of adaptations of Tolkien books. Almost a millennia after they were first told and recorded, the stories of Norse mythology still play on our minds. Kevin Crossley-Holland sums up their appeal in the foreword to his newly released book, Norse Myths: Tales of Odin, Thor and Loki. Readers will find a cyclical and perhaps even repetitive nature to these stories. This sense of repetition is one of the hardest nuts to crack in terms of bringing myths to modern readers. While an essential part of the mythic structure, it can be hard to translate into a narrative that readers today will find compelling. Fortunately Crossley-Holland carries this off masterfully. Crossley-Holland carefully crafts the sense of foreboding in this collection, and he uses the repetition in the stories to bolster this. Just as the gods cannot seem to resist the lure of Loki’s aid, so too do they seem irresistably drawn to actions that will bring them closer to their doom. Throughout the book, Crossley-Holland also demonstrates his knowledge and appreciation of the language of the original myths. This is most evident in his wordplay, which echoes the kind of humour often found in the Eddic texts. This sentences captures the fierce violence of the stories, as well as the black humour that is frequently found in Old Norse writing. However, Crossley-Holland also blends in more modern elements of levity and humour. This sense of mischievous glee brings a lightness to the stories. It is this combination that makes these stories so appealing, the Norse gods are certainly beings of immense power and importance, but they are also very relatable—they are temperamental, stubborn, playful, and likeable. While their problems and adventures are in this heightened mythic setting, their reactions seem much like our own would be. That Crossley-Holland conveys this in a way that is faithful to the original myths but also accessible to young readers today reflects both his passion and nuance as a scholar and his skill as a storyteller. Beyond the practicalities of representing the stories, Love’s illustrations are also stunning works of art. The silhouettes are given a rough texture that is reminiscent of rock surfaces, evoking the Scandinavian landscape. These are juxtaposed against bold blocks of primary colours. This contrast echoes the mythic depictions on Greek vases, with their black figures moving across a terracotta backdrop. This is one for little (and big) vikings. The stories are accessible and concisely written. Evocative, atmospheric illustrations make this something to treasure. Wow! Bought another copy after receiving the first! Beautifully illustrated and larger than expected book! I loved how this takes the complex myths form Norse Mythology and condenses it and makes it more accessible for a younger audience. This is a brilliantly executed book that covers so much information that I can see children talking about these myths, gods, goddesses, realms, long after they have closed the book. Told in an almost whimsical, fairy tale way whilst still adequately portraying some of the brutality of the hammer-wielding, creepy one-eyed and trickster Gods, this anthology plunges you into a world of crazy creatures and magical monsters in a way which just sticks with you. And actually, for quite a large collection, the stories move along at a really great pace and don’t become too bogged down with facts; rather, they are woven into the tale cleverly and more delicately than a typical “educational” text. A real master of mythology – it’s like watching a movie, only much much better, as any good book should be. This book is very fast paced and contains a lot of information. Its the type of book that once you get into it you just cannot stop and then you reach the end and think actually i rushed this and need to go back to delve in to find more. In terms of classroom use, i would say this book would be ideal in capturing the attention of boys who may not usually be keen to read. I was obsessed with Greek mythology as a child. I loved the stories of the gods and goddesses and their dealings with mankind. Lately, other mythologies have made headway into the mainstream again – with the Marvel movies, the Magnus Chase (Rick Riordan books) – and these are dark stories, just as entrancing, exciting and cinematic. 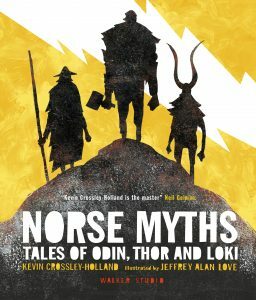 Kevin Crossley-Holland, known for many historical children’s books and anthologies combines the two here to bring us a wonderfully illustrated collection of the Norse Gods, from their creation story to those told of each God, some famous and some I’d never heard of. I liked the way the titles came with little lessons underneath: Vengeance… Expect those you’ve wronged to try to settling the score. I loved the black(/white/red) illustrations, sometimes a page wide, that gave a dark, gritty and graphic novel feel to the tales. These are not fairy tales, though they are full of the staples of them – giants, magic and powerful beings. Very easy to read, primary-aged students will not struggle to read or listen to these, especially as a very detailed glossary is included (colt and keg make appearances alongside the unfamiliar names). The very useful ‘family tree’ at the start (names and relationships of the Gods) was very handy to get to grips with before starting as well. An epic story of Odin and Norse mythology animated with a shadowy and dark imagery. This book is a great starting point if you are interested in Norse myths it certainly won’t offend anyone this is slowly becoming one of my books of the year and it is definitely worth looking at. This is a truly stunning book and one which will be enjoyed by not only kids but adults too. ‘Norse Myths: Tales of Odin, Thor and Loki’ is a large hardback book about A4 in height but a bit wider and is filled with thick matt pages. The paper is the heavy kind making this a weighty book to hold and I’d advice putting it down while reading it. There are stunning illustrations just like the ones on the cover that give this book and the tales told within an interesting and dark atmosphere. Later, I learned to distinguish between the different layers of traditional tale (myth, legend, folk-tale), and I’ve devoted much of my writing life to studying and retelling them – in particular, the tales of northwest Europe. In fact, it was my desire to engage full-bloodedly with Norse mythology that led directly to my relinquishing my job as editorial director at the publishing house of Victor Gollancz in 1976. After visiting Iceland, I worked for four years on the glorious, racy, ice-bright myths, and the book that resulted from it (in the UK, The Penguin Book of Norse Myths and in the USA, The Norse Myths published by Pantheon in their Fairy Tale and Folklore Library), has now sold strongly for thirty-five years. To begin with, I retold single folk-tales as picture-story books (The Green Children, The Callow Pit Coffer, The Pedlar of Swaffham) but later I graduated, if that’s the right word, to collections. These include my British Folk Tales (later reissued as The Magic Lands), Tales from the Old World and The Old Stories: Folk Tales from East Anglia and the Fen Country. As co-author, I worked with the Welsh poet and children’s writer Gwyn Thomas on three volumes of stories from the Mabinogion; as librettist, I collaborated with the composer Nicola LeFanu on two operas based on traditional tales, The Wildman and The Green Children, both set in the Middle Ages, and both concerned with identity, rejection and acceptance; while as editor, I compiled two anthologies of Northern tales for Faber, The Young Oxford Book of Folk-Tales and Folk-Tales of the British Isles. This anthology aimed to represent the full range of British tales and contained introductions to the tales and their collectors. One story has haunted me all my life: that of the two green children discovered at Woolpit in Suffolk at the end of the 12th century. I’ve revisited it several times and, in the version published by OUP, told the story from the viewpoint of the green girl. The way in which one retells a tale is of course crucial, and I have subsequently retold several tales as monologues. These are gathered in Outsiders (Orion), and in this book ‘Sea Tongue’ is a kind of sound-story, a fractured narrative spoken by all the different elements in the tale. During the last two decades, there has been a marked increase in interest in the Viking world, not least because of the National Curriculum, and in October 2017 Walker Books in UK and Candlewick in USA published my completely new version of the Norse myths for children (Norse Myths : Stories of Odin, Thor and Loki) with illustrations by Jeffrey Alan Love. In autumn 2018, Walker will publish a new edition of my British Folk Tales with colour illustrations by Peter Melnyczuk. And they and Candlewick will follow this in 2019 with a new one-volume Arthur containing six legends, fully illustrated by the great Chris Riddell. We are already at work on this book.